We are very pleased to announce our new Music Director/Conductor: Darwin Aquino. Please join us this summer as we welcome Mr. Aquino to the orchestra! Dominican conductor and composer seen internationally as one of the top rising Latin American artists in both symphonic and opera fields. 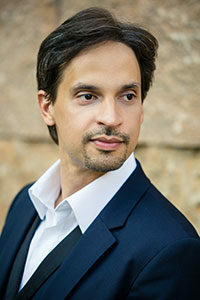 For the 2018-2019 season he continues as Music Director for Winter Opera St. Louis (G. Rossini’s L’Italiana in Algeri, V. Bellini’s Norma), Music Director for the Música Sacra concert series in Santo Domingo, Conductor-in-Residence for the Washington University Symphony Orchestra and Director of Orchestral Studies at the University of Missouri. A well-traveled guest conductor, Aquino constantly enjoys engagements around the world. Recent appearances include the 2018 New Year’s concert with the Philharmonishes Staatsorchester Mainz in Germany, Fiesta Latina concert with the Saarländisches Staatsorchester in Germany, the National Symphony Orchestra of Costa Rica, ADCA Symphony Orchestra in New York, Alfredo Saint Malo Festival Orchestra in Panama, FIU Opera Theater in Miami, Filarmónica Boca del Rio in Mexico, Youth Orchestra of the Americas, Festival Sembrando Talentos in Uruguay, St. Louis Youth Symphony Orchestra, among others. Aquino was selected as Music Director by the world acclaimed Italian tenors Il Volo for concert tours in Mexico and the Dominican Republic. As a composer Aquino is celebrating this season three new commissions of world premieres by the Florida International University Symphony Orchestra (Violin Concerto), Chamber Project St. Louis (work for 6 instruments) and Women’s Hope Chorale (Chorus, Piano, Violoncello and Percussion). Enjoy FREE concerts in July by a fifty-piece professional orchestra. Because the Brookings Quadrangle will be unavailable due to construction, we are moving three of our four concerts to the 560 Music Center in the Delmar Loop area. We are pleased to be staying in University City at an amazing facility with convenient free parking, great acoustics, ample seating and plenty of air conditioning. The Sunday concerts will be July 14, 21 and 28 at the 560 Music Center. Our first concert will be repeated Thursday July 18 at Chesterfield Amphitheater, so there will still be an option for those who prefer the great outdoors. You will be glad to know that there is a large free parking garage next to 560, as well as handicap spots in front of the building and in the garage. “Notes to Munch On / Meet the Artists” pre-concert discussions begin at 7:10pm before the concerts. The concerts begin at 7:30. See our 2019 Concert Schedule for more details. Be sure to follow Gateway Festival Orchestra on Facebook for the most up to date information. Review the highlights from our 2018 season.